So Why Aren’t More Women Reaching the Top of the Corporate Ladder? Organizational leaders should put together development plans for high-potential women earlier in their careers, so they obtain the right experiences and hone their financial and strategy skills to make it to the top. New PDI Ninth House Pulse on Leaders research shows statistical differences in the leadership competencies between men and women, with women scoring higher in overall ratings. The study also found the gap narrowed as each gender rose to the highest levels within an organization. Despite their stronger performance overall, the research found that there are fewer women at higher levels within organizations. Women make up 28 percent of mid-level leaders, 20 percent of business unit leaders and only 17 percent of senior executives. To understand the leadership talent management gap, researchers at PDI Ninth House analyzed the results of simulation-based assessment ratings of 6,000 professionals from around the globe. The evaluations were based on the leaders’ behaviors in several business simulations where they had to lead business and people issues, along with short- and long-term issues. The researchers broke down the results for mid-level leaders, business unit leaders and senior executives. Mid-level Leaders: Women in this unit scored higher in eight competencies, mainly in the people and self-leadership areas, such as meeting customer needs, establishing trust and developing others. Men scored higher in two competencies: using financial data and acting strategically. Business Unit Leaders: Women ranked higher in seven competencies surrounding the areas of people, customer focus and trust, such as ensuring execution, promoting collaboration and focusing on customers. Men scored higher in applying financial acumen and leading courageously. Senior Executives: The gap narrowed at the top with women stronger in three competencies including developing organizational talent, ensuring collaboration and ensuring customer focus. Men continue to be stronger in two areas: shaping strategy and financial insight. Researchers pointed to both motivators and experiences that may contribute to why fewer women rise in the corporate ranks. PDI Ninth House also asked nearly 19,000 men and women leaders to rank their five most important job motivators out of a list of 19. Men favored broader responsibility and influence on the organization—motivators that are more often seen at higher level roles. Women selected stimulating, challenging work and personal accomplishment—which are not found exclusively in higher levels of organizations. Finally, in terms of experiences, while men and women were equally likely to gain experience in personal development and challenging/difficult experiences, PDI Ninth House research showed women had less experience in business growth, operational experiences, and high visibility experiences. Video: PDI Ninth House’s Bobbie Little discusses gender differences in the workplace and what women can do to make it to the top. Infographic: Highlights select study findings and what women can do about it. Research Study: Provides more details of PDI Ninth House’s gender-related research studies. This data was compiled from three research studies. Thousands of leaders from around the world participated in the studies. Look for future data releases from PDI Ninth House Pulse on Leaders. PDI Ninth House Pulse on Leaders analyzes different workplace questions on a regular basis and can be used as a source for gaining insight on the inner values of leadership talent management and leadership development, as well as leadership consulting, strategy and assessment. PDI Ninth House is the world's premier global leadership solutions company. For more than four decades, we have provided integrated assessment, development and coaching solutions around critical leadership and business challenges that most directly impact each leader's success and the success of their organization. For more information, contact PDI Ninth House at 1.612.339.0927 (in the U.S. 1.800.633.4410) or visit its website at http://www.pdinh.com. Can Women Leaders Break the Glass Ceiling?A PDI Ninth House analysis of assessment ratings revealed that women scored higher in overall competency ratings than men. 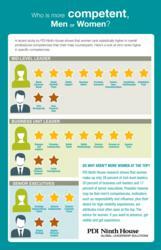 Are women more competent infographic.